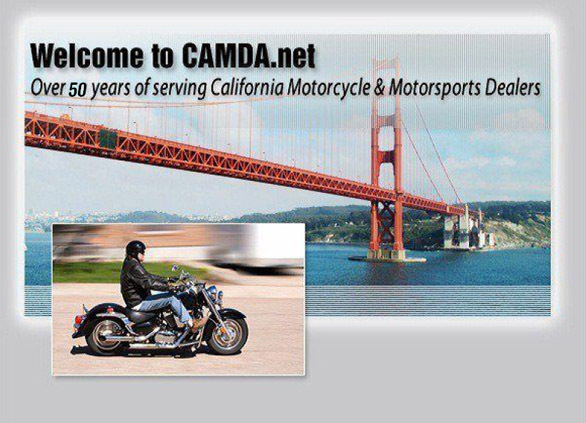 Lake Elsinore, CA dealer California Motorcycle Dealers Association is your one stop source. The CMDA was incorporated in 1971, for the express purpose of the "advancement of motorcycling, including motorcycle and motorscooter safety and the best interests of those engaged in allied and kindred industries". This original organization was, however, named the California Motorcycle Industry Council (CMIC), and became one of the Motorcycle Industry Council's (MIC) 49 accredited state dealer organizations with some 3,000 dealer members. In October 1973, Mr. Hy Weitzman, of Weitzman Associates, was selected to be the CMIC's Executive Director. Mr. Weitzman provided exemplary management and legislative advocacy for the next 23 years, during which time, the Association grew to become the premier and largest motorcycle dealer association in the U.S.
By late 1974, however, friction developed between the manufacturers on the MIC and the members of the various state dealer organizations. At an MIC Board of Directors meeting on November 13, 1974, its President announced that the franchise dealer member program would be discontinued as of January 1, 1975." Aub LeBard, the CMIC President at the time, announced the next month that the CMIC changed its name to the California Motorcycle Dealers Association (CMDA) and the present structure of the organization was born. President LeBard commented, "We chose the new name, because the term, 'Dealers Association' more aptly describes the purpose and nature of our organization than any other..."
In 1974, the CMIC (CMDA) introduced and passed legislation that brought the franchised motorcycle dealers of California under the auspices of the New Motor Vehicle Board. As a result, any factory wishing to place an additional dealer within a ten-mile radius of any of its dealers must notify the dealer of its intensions and the dealer may protest this proposed action. The Board then adjudicates the matter. Hundreds of dealers have benefited from this legislation over the years. Additional provisions were added which strengthened the dealers’ ability to negotiate with the manufacturers. During these years, a veritable "who's who" among California motorcycle dealers served as President, or in some other valuable officer's capacity for the CMDA — Ted Evans, the aforementioned Aub Lebard, Dudley Perkins, Ron Ruffalo, Harold Mathews, John Motley (who later went on to serve as a Member of the Off-Highway Motor Vehicle Commission of California), Bill Chaney, Chuck Holenda, Bob Combs, Tex Thorp, and Ray Sulway. In 1983, the CMDA was able to include three-wheel ATVs under the New Motor Vehicle Board's jurisdiction, thereby making the bargaining position for dealers of these vehicles also much stronger. In 1997, Wayne Thomas and John Paliwoda, took over the reins of the CMDA’s Executive Director and Director of Government Relations, respectively. Paliwoda assumed both responsibilities when Thomas passed away, unexpectedly in 1999, and has served as the CMDA’s Executive Director ever since, being only the third CMDA chief administrator in almost 40 years. Motorcycle safety was always a high priority with the leadership of the CMDA; before the passage of AB 412 in 1986, which established California's award-winning California Motorcyclist Safety Program (CMSP), two of the four motorcycle rider training bills that were introduced in the 10 years from 1975 to 1985 were sponsored by the CMDA. The passage of AB 412 was assured by direct support from the CMDA. The funding for the CMSP is provided by a surcharge of $2 for each motorcycle registration. In 1997, the CMSP's existence was assured for 5 more years, because of CMDA sponsored legislation to ensure that new motorcycle operator's license applicants would be able to take advantage of the safety education and training elements of the CMSP which has saved so many lives, and prevented tens of thousands of debilitating accidents and injuries since its inception in 1987. With the passage of the CMDA’s AB 975 in 1999, the CMSP was finally made permanent. AB 975 also provided an annual transfer of funds from the state’s Penalty Assessment Fund to the CMSP to offset the $2 per registration shortfall due to drastically declining motorcycle registrations because of the unforeseen effects of California’s unpopular helmet law that depressed ridership and ownership deeply. • The passage of 1988 legislation to protect dealers from out-of-state low mile age non-emissions-complying motorcycles which were sold at a disadvantage to California dealers. • A 1989 effort which defeated the proposed inclusion of motorcycles in the "Lemon Law" provisions which cover automobiles and trucks. • In the early 1990s, the CMDA lobbied hard for the congressional defeat of the U.S. EPA's Federal Implementation Plan (FIP) which would have imposed draconian emissions controls over every facet of life in California. Motorcycle emissions standards would have been dropped so low, that most existing on-highway models would have been banned from sale in the state. • In 1994, CMDA-sponsored legislation brought all terrain vehicles (ATVs) under the auspices of the NMVB, and in 2004, the CMDA finalized that process by sponsoring legislation to correct a drafting error in the original bill. • In 1996, the CMDA headed a coalition of industry and rider groups to oppose a no-fault motor vehicle insurance plan which would have made motorcycle insurance premiums unaffordable for most riders. The initiative failed by a two-to-one margin. • In 1998, the CMDA stopped the California Air Resources Board’s (CARB) “Smog Police” from inspecting California motorcycle dealerships, without notice, for evidence of tampering with OEM emission parts and systems on motorcycles. • In 1998, the CMDA persuaded the California Air Resources Board to amend its off-road motorcycle and ATV regulation to allow the use of non-certifying models in areas of the state where, and when, the ambient smog levels are at their lowest, creating the “red sticker” program, that augments the off-highway “green sticker” program. • In 2000, the CMDA’s efforts defeated a bill that would have forced California motorcycle dealers to verify a buyer’s operators license status before leaving the dealers’ premises, which would have exposed every dealer to an unacceptable level of liability risk. • The CMDA worked closely, during this time, with the personal watercraft (PWC) industry to advocate more reasonable CARB engine emission standards, so that CMDA Members who sold PWC could maintain strong sales of this product that was unreasonably targeted by extreme environmentalist interests. • The CMDA was successful, in 2005, in exempting motorcycle dealers from having to offer a 3-day unconditional return policy for buyers of used motorcycles, accurately contending that the potential damage to motorcycles is far more than to an automobile or truck. • In 2006, the red sticker areas were greatly expanded, and in 2007, the CMDA was largely responsible for removing provisions in a major off-road vehicle program reform bill, that would have eliminated future red-sticker OHV sales and registration, thereby saving this popular program from another attack. This was especially important to many California motorcycle and motorsport dealers from which their income from the sales of off-highway vehicles is derived. • In 2007, The CMDA passed legislation to allow dealers to install CARB-legal performance emission parts on new motorcycles at point-of-sale. of California motorcycles, with all of its potentially detrimental effects on dealers and owners. • Working with California’s auto dealer association, in 2012, the CMDA helped defeat a multi-front attack on the very existence of the state’s New Motor Vehicle Board, California motor vehicle dealers’ first line of defense against franchise disputes with their manufacturers. • In 2014, CMDA-sponsored legislation, that was signed into law, brought Side x Sides, a new very popular ATV-offshoot type of off-road vehicle, under the jurisdiction of the aforementioned New Motor Vehicle Board. Side x Sides (or Recreational Off-highway Vehicles) are the fastest growing segment of California’s off-highway vehicle business, and their retailers and dealers can enjoy the franchise protection that this legislation brings when the almost inevitable franchise provision disputes with OEMs arise. Over the years, the CMDA has provided tangible benefits for its many members, which included a majority of the franchised motorcycle dealers in California. Members benefit from the group savings on Workers' Compensation Insurance, instructional seminars, Bankcard services, business planning, and free legal advice on business matters. The CMDA Workers’ Comp Program, to which most CMDA members belong, has been an important CMDA member benefit going back almost four decades. An important part of that successful program is a workplace safety promotion element, that helps keep the group loss ratio low. Most members find that they, at least, save the cost of their membership dues by participating in the program. New benefits are constantly considered, because of the ever-changing California business climate. The achievements of the CMDA, over its decades-long history, demonstrate its commitment to the motorcycle and motorsport dealers of California. Its leadership consistently has the best interests of its franchised dealer members in mind. The heritage of protecting their business interests continues into the 21st Century, with the challenges of the advent of different types of motorsports products constantly being added to the product lines that motorcycle dealers offer to eager customers. Only vigilance on the part of its Administration, and courage on the part of its elected Board Members, will ensure that California's motorcycle dealers will remain healthy financially, and expand aggressively into the future.